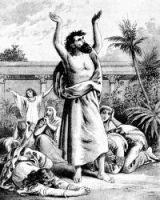 The Book of Esther, one of the latest of the canonical books of Scriputre, was written late in the reign of Xerxes, or early in that of his son Artaxerxes Longimanus (B. C. 444 - 434). The author is unknown. The Book of Esther is placed among the hagiographa by the Jews, and in that first portion of them which they call "the five rolls." It was written on a single roll, in a dramatic style, and it has often been remarked as a peculiarity of this book that the name of God does not once occur in it. One possible reason is that this allows the reading of the book at the hilarious and noisy festival of Purim, without irreverence. Another explanation is that the author wished to avoid giving offense to the Persians, or that the whole was taken from the Persian annals, to which an appeal is made. The style of the writing is remarkably chaste and simple. The Hebrew is very similar to that of Ezra and parts of the Chronicles; generally pure, but mixed with some of Chaldaic affinity. 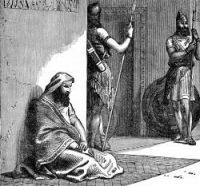 These drawings from the Book of Esther are from a variety of Bible books. Feel free to use these Book of Esther pictures in your artwork. Click on the drawings of the Book of Esther below to see more details about saving a free image or about purchasing an image at a higher resolution.